Things inside my knee, hopefully for the last time. 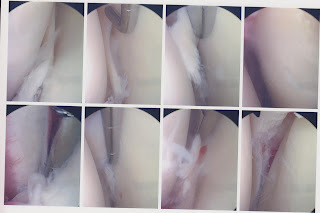 The top is lots of shredded looking stuff--my meniscus pre-repair, I'm guessing. I think the bottom set includes my ACL (undamaged) and my meniscus (newly-repaired).